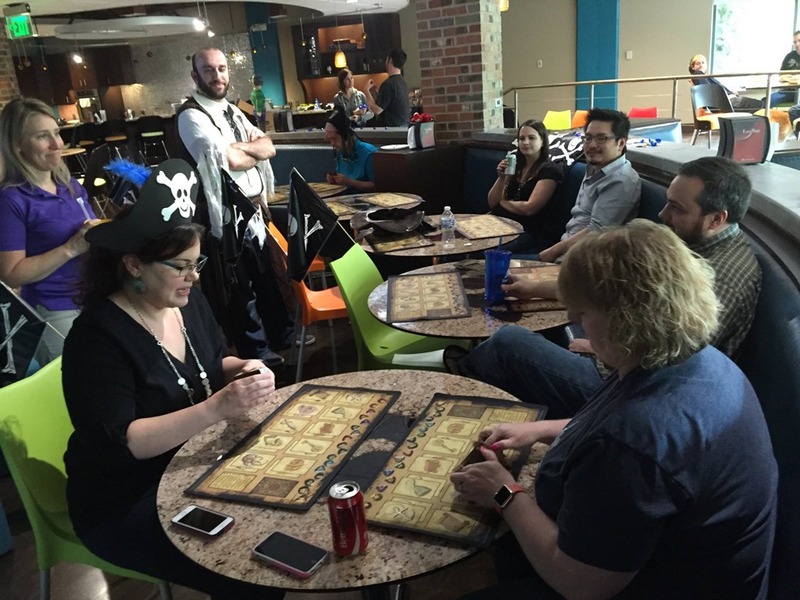 Stardock's First Annual Dead Man's Draw Tournament: The Recap! Ahoy, mateys! Your "resident pirate" Kristy here, with some mighty tales from the high seas for International Talk Like a Pirate Day! 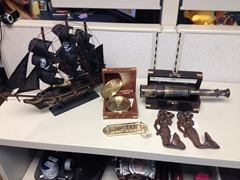 ...And by "mighty" , I mean silly, and by "high seas" I mean Stardock's basement. Now that we've established some clarification of my tendency to embellish, allow me to continue! At high noon, our tournament participants filed downstairs for some pizza and a recap of the rules. 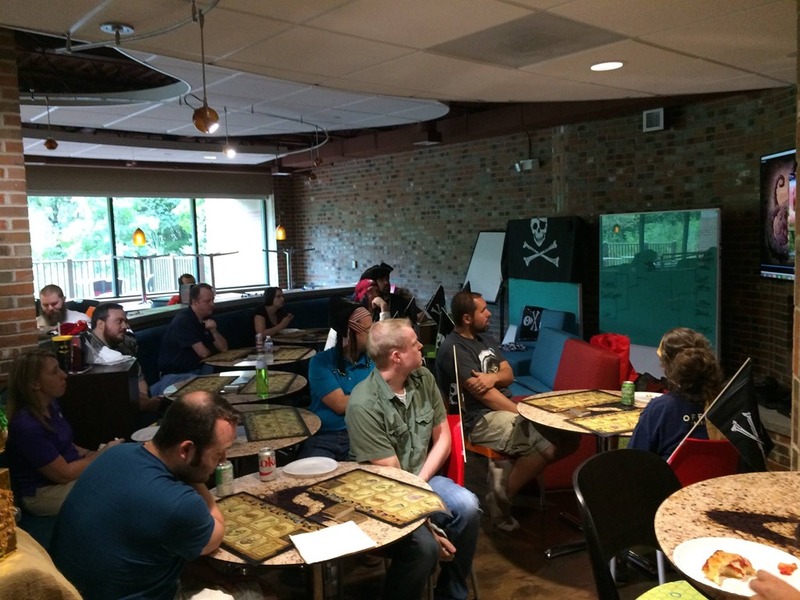 We had a wide range of players, from people who had worked directly on the game, to other enthusiasts, and even some people who had never played before at all. After watching the rules video, play began! We had 16 participants in the tournament, including 3 different members of the development team. After some good natured trash talk, we all sat down to play. The best thing about this game is that it is simple, fast, and fun, and our rounds were over before we even knew it! 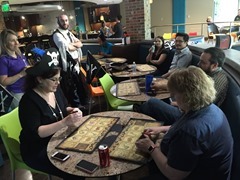 My own fierce high sea battles were surrounded by the dismayed cries of the members of the Dev Team as our COO, Angie (aka The Dark Queen - and now I know WHY she has that name!) took them out one by one to claim the title of Captain for the year. The battles were mighty, the foes were many, and the pizza was delicious. 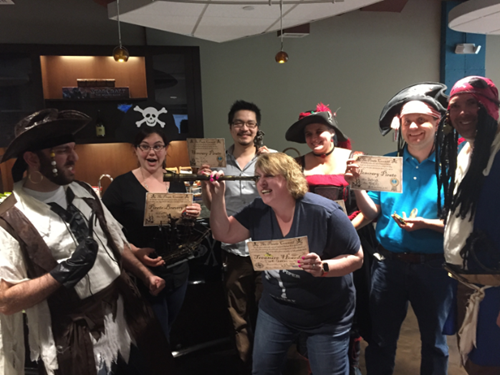 In all, we are looking forward to our next tournament and our chance to mutiny on the Dark Queen and steal the title of Captain! Arrrr!